Noah Carver, a blind student from Beals portrays the Sparrow in Brundibár, urging protagonists Luna Lord (Aninku) and Cadence Nickerson (Pepicek) to fight back agains the bully. Photo by Brandy Argir. Costumers Jessica Brissette and Debbie Staggs labored long over accuracy in the detailed costumes, all of which were either 40’s replicas or actual vintage pieces from the era. 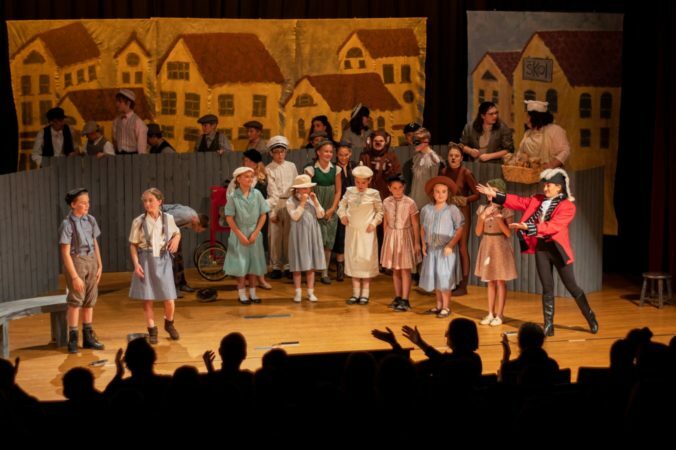 Many of the pieces were loaned by other organizations such as The Grand in Ellsworth and the Whiting Village School, but the leads’ costumes were made specially for the production out of a fabric similar to what the inmates were required to wear as uniforms in the concentration camps. Conceived three years ago by Gregory Biss, Sarah Dalton-Philips and Helen Swallow, the Brundibár project has been a long-term labor of love for all involved. 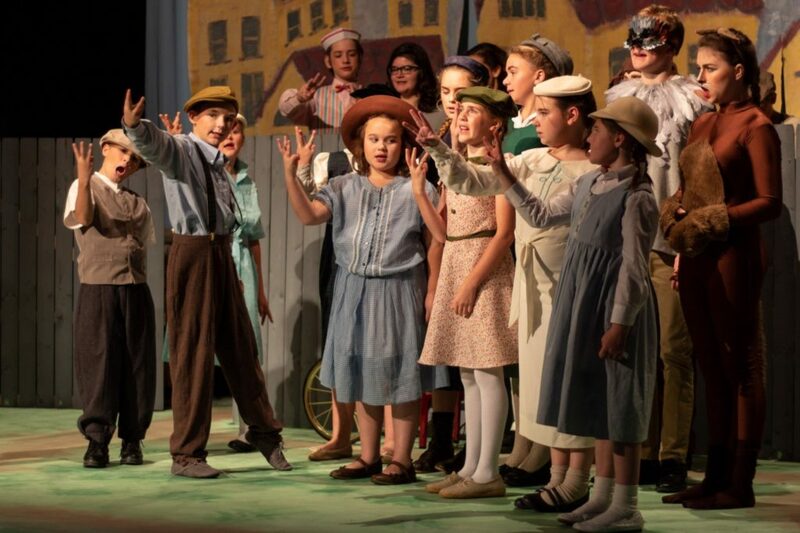 Biss served as conductor and musical director for the production; Dalton-Phillips directed and memorably conducted the question-and-answer sessions following each school performance. The team pulled in Chris Grannis to create the props and as stage manager and Ken Varian ran sound. In addition, myriad volunteers lent support to the project. Voices united in harmony, the children of Brundibár sing a beautiful lullaby in hopes of earning coins to buy Pepicek and Aninku’s ill mother a bottle of milk. 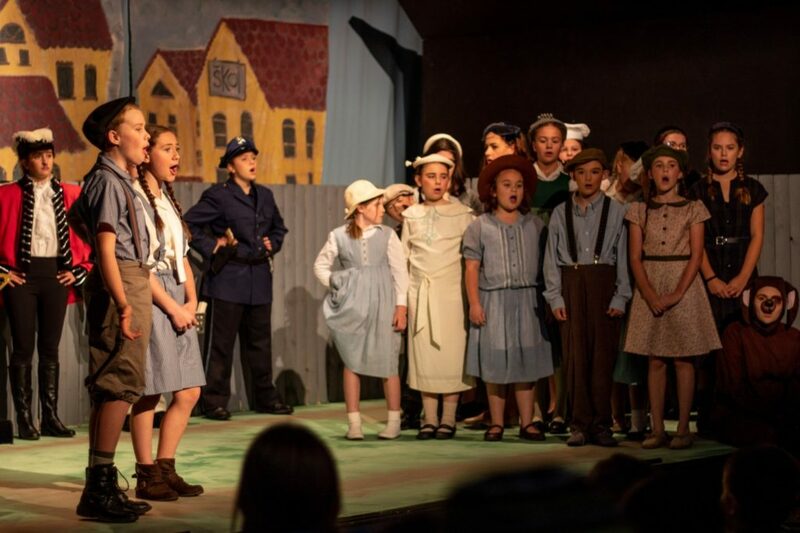 Hannah Maker (from left) portrays the bully, Brundibár; Cadence Nickerson and Luna Lord are Pepicek and Aninku; and Madyson Curtis is the Policeman. Photo by Brandy Argir. Swallow, who produced the show alongside fellow PBSO member June Gregory, enthused about the many triumphs of the production, including performers transcending physical disability, learning difficulty, and stage fright, including a particularly spectacular case for one of the youngest performers—Addi Landrum, a homeschooled student from East Machias. 8-year-old Addi’s one ‘line’ (to state her name and role at the end of the show) initially gave her so much trouble that she’d sneak offstage to avoid the moment. By the end of the run, Addi could announce herself clearly and with confidence. Swallow asked her what had changed. “If you do it once, it’s like you get used to it,” said Addi. Addi is daughter of the production’s Music Coach, Eustacia Landrum, who worked with the chorus and leads on the songs; Landrum previously served as a music teacher at Elm Street Elementary school and now has changed her path to homeschool her three children. 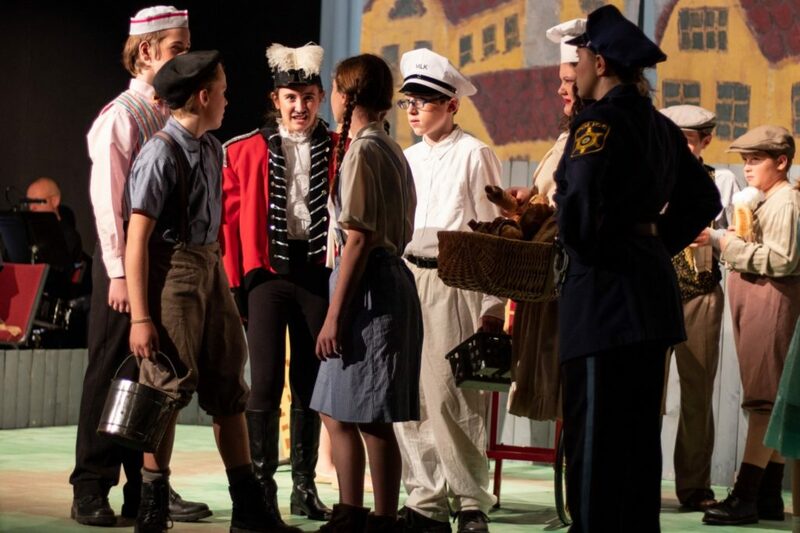 “For us this is just another unit of school that we’re doing,” said Eustacia, and noted that nearly half of the children in the production are homeschooled. The perk for the homeschooling families was that they didn’t have to negotiate with schools to arrange their children’s absence during the 8 school day performances. 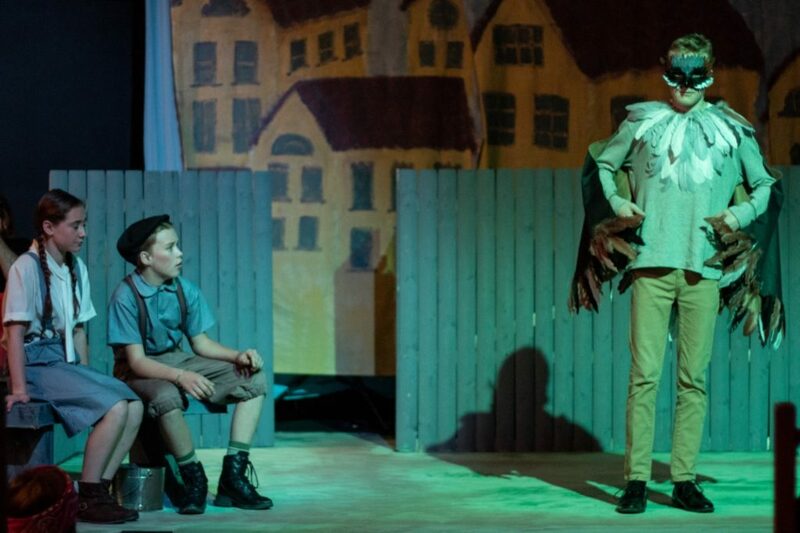 A sneering Brundibár, played by Hannah Maker, overpowers Aninku and Pepicek’s first efforts to get the milk for their mother. Photo by Brandy Argir. Chorus members sing their triumphant finale. Photo by Brandy Argir. Those inspired and interested in becoming involved with future projects of the Music for Children program should email Helen Swallow at pinkcottage@roadrunner.com. Brundibár was supported by generous grants from The Maine Community Foundation (including the Bary Lyon Small Fund), The Maine Arts Commission, and The Stephen and Tabitha King Foundation. For more information please visit the Passamaquoddy Bay Symphony Orchestra page at eastportartscenter.org.